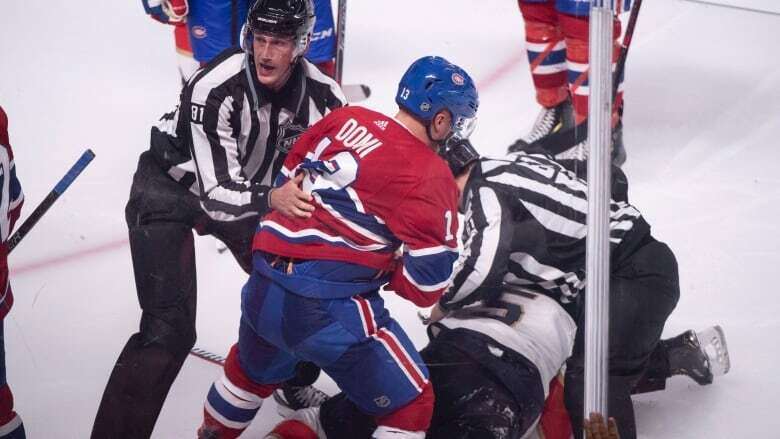 Montreal Canadiens forward Max Domi has been suspended for the remainder of the NHL pre-season after punching Florida defenceman Aaron Ekblad during an exhibition game. The punch came at the start of the third period of Wednesday's pre-season game. Domi began tugging on Ekblad's shirt, asking him to fight. With the Panthers star showing no interest to drop the gloves, Domi punched him in the face twice, but still Ekblad didn't respond. Domi then dropped his right glove and sucker punched him right on the nose, and the bloodied Ekblad dropped to the ice. Domi was given a minor, major and match penalty on the play. Domi, who was making his first appearance as a Canadien after coming to Montreal in an off-season trade that sent Alex Galchenyuk to Arizona, met with the NHL's Department of Player Safety on Thursday. Brendan Gallagher had a goal and an assist as the Montreal Canadiens earned their first win in three tries in the pre-season, beating the Stanley Cup Champion Washington Capitals 5-2 on Thursday at the Videotron Centre. The Habs bested a Caps line-up that featured captain Alexander Ovechkin in his pre-season debut, as well as playoff star Evgeny Kuznetsov. Michael Chaput, Jacob de la Rose, Artturi Lehkonen and Rinat Valiev also scored for Montreal. Charlie Lindgren stopped 11-of-13 shots for the win. Tomas Tatar, making his debut with the Canadiens after coming to Montreal in the trade with the Vegas Golden Knights for former captain Max Pacioretty, earned a point and first star. Ovechkin and Connor Hobbs scored for the Capitals. Pheonix Copley stopped 20-of-24 shots before giving way to Vitek Vanecek, who made three saves in relief. Bo Horvat put up two goals in regulation and another in the shootout as his Vancouver Canucks beat the L.A. Kings 4-3 on Thursday in pre-season play. Nikolay Goldobin scored the shootout winner while Sven Baertschi put up Vancouver's third goal in regular time. Tanner Pearson, Emerson Etem and Adrian Kempe all scored for the Kings in regulation. Kings goalie Jack Campbell stopped 22 of Vancouver's 23 shots in the first two periods, before he was relieved by Peter Budaj, who turned away 7-of-9. Vancouver netminder Jacob Markstrom stopped 29-of-32 shots. The Canucks opened the scoring near the end of the first when Elias Pettersson got the puck along the boards on a power play. The 19-year-old Swedish rookie made a slick between-the-legs pass to Baertschi, who connected with Horvat in front of the net. The 23-year-old centre buried the pass and Pettersson chalked up his second assist of the pre-season. The Kings responded by tallying three goals in the second period. Early in the frame, a battle in front of the Vancouver goal ended with L.A. winger Kempe poking the puck in past Markstrom, who was sprawled out between the pipes. Pearson doubled the Kings lead midway through the period, collecting a crisp pass in the centre lane and firing it directly into Vancouver's net. Etem notched L.A.'s third goal of the night, redirecting a hard shot by Alec Martinez in past Markstrom. The Canucks got back within one five minutes into the final period, when Tyler Motte got a pass off to Horvat, who went 2-on-1 with Goldobin. Horvat stayed patient and snapped a hard wrist shot in past Budaj to make it 3-2. With just over four minutes to go in the game, Vancouver's power play struck again. The Canucks stayed patient, passing around the edges until Pettersson saw Horvat open down low and made his move. Horvat collected the pass and immediately fired it off to Baertschi in front of the net. The left winger sniped a quick shot past Budaj, tying the game. Overtime saw a flurry of excitement, including a strong penalty kill by the Canucks, but no score. The Canucks have four exhibition games left, all on the road. They'll start with a visit to the Calgary Flames on Saturday.